Hi Anita, I have never meet you or your family but I have not forgotten Aria. She was an inspiration in my life and my children’s lives we follow your blog together. It will be sad not getting your blog in our Inbox, but I can understand the need to end it. Truly deeply we send love and prayers your way xo. In my lifetime I will never forget you McDonalds!!! Anita, words cannot describe how sorry I am for your loss. I’ve been following Aria’s story for a couple of years now, but never felt able to comment. You will always miss Aria – my Gran and my Mum never stopped missing my Uncle after he was killed. With time though, it does get better, you will be able to think of her without crying, you will begin to feel that its ok to laugh, to have fun. Grief is the price of love, but isn’t love God’s greatest gift? It just takes time. What you wrote above could have been written by me 7 years ago when our daughter died, exactly how i felt! And 7 years since she died, there is joy in each day, a dance to be had and precious memories that i am blessed with. Like our daughter, those who loved her will remember her in their own precious ways. She will never be forgotten. And I hope my daughter and Aria are running around in heaven clothed in full glory, healed and whole. Love to you all! I will miss this update if you close it BUT I will also see it as a time of closure for you. Please take care and live every moment as a gift, you are the most precious family and deserve the best life has to offer. Have wanted to tell you for a while that I still think of Aria everyday – every single day, but didn’t quite know wether to say it to you out loud. Anita, these are such hard days…the joys will come in little unexpected moments, the dancing maybe farther down the track. But I do believe that one day the Psalm in the verse will be true for you. In the meantime, please know we never forget precious Aria, and we never forget all that has happened to you and your family. I think of you all SO much. Your journey is with me for all time. Mourn all you need. By a miracle we can not understand, we have a God who weeps with us. You will know when the time is right to move on ……. to close this page, BUT NEVER CLOSE ON ARIA, she was, and is and always will be part of your lives. I would love to hear from time to time how you life is going, we are sort of wrapped up in you now, having been with you for so long. Maybe it is time for a new chapter for you. God will always be there with you. I am so thankful that I can’t kid God, I can’t pull the wool over his eyes, He knows me through and through …… He knows exactly where you are and how you feel …… He holds you close. Praying for you to begin to feel like dancing. I am continuing to pray for you and your family. It’s what I know to do and it is my gift to you in the midst of your mourning. I thank God for that privilege. Thank you for letting us know what you will do with this website and beyond it. I know the Lord will lead and guide you into what He wants. You have a very powerful witness and I can’t help but believe He will use that in mightier ways than we can ever imagine. I send my love to you all. Anita & Hamish, I promie you that I haven’t forgotten what your family has been through. I may not be able to bring you a meal, because I’m in America & not New Zealand, but I always remember you in my prayers. I lost my dad a few years back, & I know that’s not the same as losing a child, but the grief will be raw for a while. Eventually the pain will ease up. Pain will always be there, but it will ease up. Someday, God will wipe away all our tears. May God continue to comfort you, and may He bless you! I like Esme’s comment that grief is the price of love, but perhaps I would turn it around. When all my beloved cats have died, George has queried why I do it to myself, but I firmly believe that if you don’t open yourself to love, you don’t live and that emotion be it good or bad is all part of life (so we now have Rosie to love). My birth mother is fading away and I know I’m not going to have her for much longer but whilst it hurts, I also am so grateful that I’ve had her in my life for 9 years and have gained 2 half sisters. So good does come out of bad and you have to believe that Anita. I would be sorry to have you close this site (but that’s for me, not you and you must do what is best for you) as my heart jumped this morning when I opened my e-mail and there you were. I see Aria such a lot because I open My Planner on MySky and she appears in the first Attitude programme I saw about her and I click on to it for a moment and talk to her! Love you lot and heaps of warm fuzzies to you all. Thank you for sharing from your heart. Every time I drive by UNMC (several times a week) I think of Aria and our one time meeting on that Saturday morning, a time of prayer. I wish I had come and met you before then, and I wish I had met Asher before you left. I think of Aria and pray for your family often. I will not forget Aria. Honey, please know that we are grieving alongside you too, every day. Aria is still very much in our thoughts and hearts and I have just kept my distance because I don’t know if you can deal with us right now or if we are reminders of the bad stuff. I will always be here waiting and will always keep Aria in our memories and you too. When you are ready for that coffee and hugs I will be here, the kids can play and we can talk and remember. PS lovely pic of you and Shirley in the Courier! Lovely to read your new up-date. I have never forgotten Aria or you and your family. That is why we keep looking up your latest up-dates to hear and read more about you all and how you’re getting on. It will be hard for a long time but eventually you will start laughing about funny things Aria did and enjoying lots of lovely memories. I think that this next year for you will have lots of wonderful times and new happenings for you all which will help. God never forgets what you’ve been through and He is always there to uplift you in the hardest times, and there will always be lots of these even though there will be more and more better times as well. I’ll miss reading about you all but will never forget you. me in such a way that I will never forget her nor the way your family helped me in my walk with God.He has used your family in a mighty way. I still remember you in my prayers daily and will not forget Aria, just as I will never forget my little Wendy who passed away 44 years ago on 31st October and my Husband Allan who left me in February this year.I have just sold my house that we shared for nearly 50 years so am making a new start. If you feel like it is time to close this site, we will understand that it is time for you also to move on. God bless you and keep you moving forward. Love in Jesus’ name, Judy Palmer in Christchurch. Just yesterday I was thinking of your family. How it felt like ages since Aria was gone but how recent this actually is. And how real the pain must still feel for you. It is a year and a half since I lost my dearest Mum but there is till date a vaccuum which cannot be filled. Every prayer every occasion I still bring her to my thoughts. I am confident this will be the case as long as I live. As i grow older my only wish will be to unite with her and to hold her hand once again. Our loved ones die and leave this world but NEVER our hearts and minds. Still thinking of you. Will be really really sad not to have access to Aria’s site. 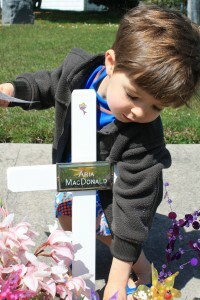 I love the picture of Asher tending to his sister grave. It’s beautiful. I too will miss your blogs, and know that like many others I think of you all often and often. Praying for you all. Yes a truly beautiful picture of Asher. Along with so many others I will never forget you Anita and your family and the beautiful brave Aria. Think of you all often. I have never posted but have followed for quite some time. Aria was amazing……courageous and beautiful. God took her home way too soon, but perhaps He needed her. Trust me, you will feel joy and will dance…do it in Aria’s memory. I hate to hear this site may be closed but I understand why. Perhaps you could begin a new blog about the family as we are still interested in you, Hamish and wee Asher. We all miss Aria and will never forget her. I too have been following your blog for a while. I too will miss it! i still check it daily–i still pray for you guys as we remember Aria–such a precious child–a true blessing from God–she will continue to bless even in her absence on this earth. She touched so many lives–all of you did–thank you for sharing all of that with us. I’ve never lost a child so i don’t know what that’s like, but when i lost my dad 20 years ago i absolutely thought i was going to lose my mind! It’s so crazy how grief works–as a Christian you know they are in a much better place. A place we all long to be–with our Lord and Savior, but oh, my gosh, it just hurts SO bad! We know all the “right” things to say–we know how we’re supposed to feel, but truth be known it’s just a foreign, awful place to walk! I often think, what on earth do people do if they don’t have Jesus? How do they make it thru something like this? I don’t know–i don’t see how they can. It is true tho even after 20 years I miss my daddy LOTS!! Just thinking of him makes me cry, but i don’t feel like i’ve been kicked in the gut anymore–i don’t feel like i need to scream until i’m hoarse. I guess what I’m trying to say is time does make it easier–I’m thankful that you have your memories, that you have Asher, that you have your family around you, but most of all that you have the peace of our king. Just hang in there sweet girl and let God love on you, thru your friends, may you find peace and comfort. Maybe you can start an Asher blog so we can all watch him grow up! I’m a big fan of blogs! You hang in there. You are not forgotten MacDonald family! I pray that you may continue to be comforted by God and those around you and that God will turn your mourning into dancing. God bless. Hiya so pleased you are still writing, the pain is always there but this lessons as time goes on….keep up the contact there are heaps of people connected to you and your family and especially little Aria. Hamish, Anita & Asher: We miss you all so much! I was reminded of you yet again this morning as I sprayed Aria’s hair de-tangler into Praja’s hair . Ever since our parting words at the apartment complex I’ve been wanting to write you some thoughts I have. Thank you for keeping in touch w/us through this medium… I will get in touch. Praying for you all. Randy, for all Arms. Every time my son plays the keyboard (and it’s reluctantly sometimes! )I will remember Aria…and you guys too. You have certainly not been forgotten and the website is checked often for posts as to how you are coping. I’ve kept up reading this site because we continue to pray for you all nearly everyday and we want to know how you are doing. Please keep us in touch so we can pray effectively. I know what it is to grieve and have wanted to commit myself to pray for you in your heart ache and journey. It takes a long time in my experience and I’m not sure the sorrow ever really goes away. But the Lord does restore our hearts again and brings us into a new and deeper understanding of Him and His ways. He is the Lord who is full of compassion and makes all things new. Keep trusting in Him and He will not fail you. Aria is not forgotten, and neither are you. Love and hugs. I will not forget Aria, just as I never forget the children who passed in our family. I like your texts very much. That is why I like to use them in my paper, if it is possible. I am interesting in that topic, therefore I need you help. Please, say YES. Thank You. We absolutely love your blog and find a lot of your post’s to be exactly I’m looking for. Does one offer guest writers to write content to suit your needs? I wouldn’t mind creating a post or elaborating on many of the subjects you write regarding here. Again, awesome website! You’ve made some respectable points there. We looked on the web for the matter and discovered most people goes in addition to along with your site.